This is a service release that adds support for Drupal 8.5.1. Acrolinx for Drupal 1.0 just didn't get along with Drupal 8.5.1. We strive for a supportive environment, so we added support for Drupal 8.5.1. We've developed and tested Acrolinx for Drupal - Version 1.0.1 with Drupal versions 8.1, 8.2, 8.3, 8.4, 8.5.0 and 8.5.1. This release welcomes a shiny new Sidebar integration for Drupal to the Acrolinx family. You can get started with it in your Acquia Cloud or standalone Drupal environment. Take a look below at what this release has to offer, or jump straight to our Acrolinx for Drupal user guide or Acrolinx for Drupal Administrator Guide if you want to get started right away. We've made Acrolinx available as a Sidebar that you can move around as you like. The Sidebar can check any content that you're able to edit in Drupal, including captions and alt text for images. To make checking in Acrolinx for Drupal a breeze, starting with Guidance Package 5.4, you get a new Content Profile included for Drupal. You can also update your earlier Guidance Package to get this new Content Profile. SSO means that if you're signed in to Drupal, you're automatically and seamlessly signed in to Acrolinx. To use Acrolinx for Drupal, your Acrolinx administrator has to enable SSO. Check out the article on setting up SSO . Embed Check Data gets promoted to the Drupal UI with this release! 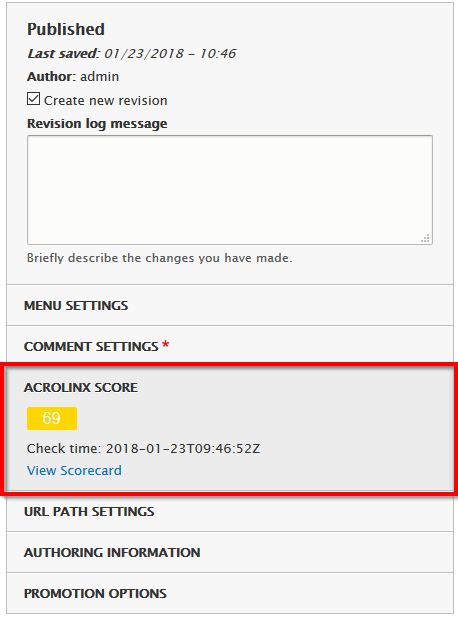 If your administrator enables Embed Check Data on the Acrolinx Server and in Drupal , Acrolinx saves the Acrolinx Score, time stamp, and link to the Scorecard for all your checked content. This information gets stored in your Drupal database, but it also appears in a field in the Drupal UI after you run a check. Just another way to keep track of your content quality at a glance! By default, the Sidebar appears in English. If you want the Sidebar to appear in a different language, then your administrator can change the Drupal UI language—this will automatically apply to your Sidebar as well. You'll need a new license to get the Sidebar edition activated. We've developed and tested Acrolinx for Drupal - Version 1.0 with Drupal versions 8.1, 8.2, 8.3, and 8.4.